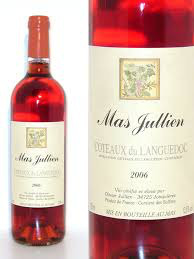 Wine Mas Jullien Coteaux du Languedoc Rose 2018 - Royal Wine Merchants - Happy to Offer! Cinsault, Carignan, Mourvedre This is a siagnée rosé made from juice that is bled off the skins of red grapes from Jullien’s vineyards on the Terraces du Larzac. Truly a wine of terroir, this is the one of the most structured rosés we see each season, a somewhat wild wine of deep, earthy complexity that does beautifully at the table with virtually any grilled fare. Organic and Biodynamic. Olivier Jullien‘s rosé, from the craggy high-altitude vineyards of the Terrasses du Larzac, sits alongside Chateau Pradeaux and Chateau Simone in that very slim category of rosés that improve and develop with a few years of bottle age. Whereas, saignée rosés sometimes suffer from heaviness and unnecessary fruit weight, Olivier’s offers the same fresh, lifted minerality and ringing purity as his red wines.